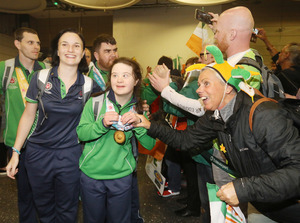 Some of the 91 members of Team Ireland arrive home from the Special Olympic World Games after winning 86 medals in Abu Dhabi, including 30 gold, 29 silver, and 27 bronze. From top: Katie Dillon (4th place: shot putt) Emma Barrett (gold, freestyle relay swimming); Mark Claffey (gold, golf); unidentified; Sarah Kilmartin (gold: basketball). 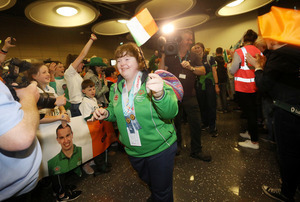 Posted in Misc and tagged Special Olympics, Team Ireland at 4:22 pm on March 22, 2019 by Aaron McAllorum. Excellent! Doing the country proud lads. Well done to all of them. 86 is some haul! Well done lads! Great achievement. Wonderful achievements all round. Well done. 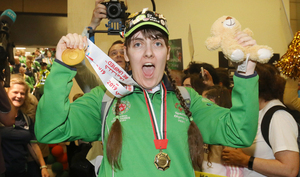 Congratulations to all the athletes and well done Team Ireland.As an aside and in no way meant detract or take away any credit from the amazing achievements by these athletes,I have a problem with Denis O’Brien-yeah I do actually. He chairs this and has the Garda Assistant Commissioner sitting next him,while CAB was reported to want a word.The board is a who’s who’s and should not be chaired by Denis O’Brien.The Tate Gallery has shunned the Sackler family and refuses accept its donations.Its long past time Irish charities turned down and stopped appointing to its boards,non irish residents who live ‘off shore’ thus avoiding Irish tax,who’s business conduct was condemned by a tribunal,who have sought to litigate at every possible chance and stifle free speech.He’s no ‘ambassador’ for Ireland,unlike these amazing competitors. Again well done to all the brillant athletes. So were all good with the UAE now? Fan-P-king-Tastic.